Okay, most of the focus in the past week of NBA life has been on LeBron James and his decision to return to Cleveland but that isn’t the only story in town. Yes, the Cavaliers are sure to benefit and it is likely that the entire city of Cleveland will be boosted by the return of the King (and LeBron will do not too badly out of the deal as well) but there have been plenty of other winners and losers in the past week with the free agency market kicking into life. 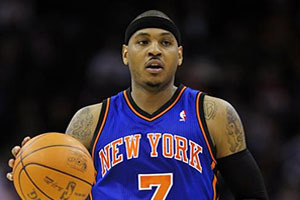 Carmelo Anthony has decided to stay with the Knicks and this is a big moment for the New York club. They may have faced a mutiny from their fan base if Anthony was allowed to slip through their fingers but as it is, the team and management can relax at the fact that the player is heading nowhere. The Chicago Bulls may not have been able to entice Anthony to them but in every other aspect, the club is looking in good shape for the season that is about to unfold. The team was already looking good in defence, Derrick Rose is hopefully returning to top form and fitness and the Bulls have picked up Nikola Mirotic (one of the top picks from Europe) and Pau Gasol, so the offence is starting to look quite exciting. The fact that Taj Gibson has remained on board is another boost and there may well be some fans putting money on the Bulls to perform well this season. Obviously the San Antonio Spurs head into the new season as reigning champions and they have managed to hold on to a great number of the men that made this possible. Gregg Popovich is still the coach and while there were some concerns over the future of Matt Bonner, Patty Mills and Boris Diaw, they’ve retained them all. With some other smart moves, including drafting in Kyle Anderson from UCLA, the Spurs would be a smart bet for back to back titles. The NBA Futures market is one of the most exciting and lucrative betting markets available and there will be fans placing their money on the Spurs holding on to their crown in the NBA. No matter how you slice it up, and they did manage to keep Chris Bosh at the team, the Miami Heat have to look on the summer of 2014 as being a disappointing one. While there is joy in Cleveland, there has to be some fear and trepidation in Miami over what will happen this season now that LeBron James is no longer in town. The same may be said for the Houston Rockets who shuffled some players out of the door in the hope of bringing in a big name. There was talk of LeBron or Carmelo coming, there was even faint hope that Chris Bosh would make his way to Houston but none of this materialised. Bringing in Trevor Ariza is hardly the worst thing in the world but it isn’t going to excite the fans too much.